November 19th finally arrived and with that we all headed over to check out with customs before we were able to start the "race". Once that was completed we all headed back to our vessels and cast off our lines with excitement and trepidation. All of the boats headed out to the "start line". We headed into the wind and raised our main. There were some hick-ups and we ended up being on of the last boats to cross the start line..... oops. Once we got ourselves settled down Marnie was at the helm passing boats like a formula one driver. Before we left Tenerife Shaun and Wayne had talked about how the watches/galley time would be distributed. They came up with a great plan, during the day from 6:00 AM - 6:00 pm a single person would be on watch for 4 hours at a time and 6:00 pm - 6:00 am a single person would be on watch for 3 hours at a time. For cooking, we each were assigned a day, on that day the galley person made lunch and dinner and had no watches unless there was an emergency. Paige would also take a watch in the afternoon allowing for the person on that watch to do the dishes. I had to cook every fourth day which was awesome, it gave me time to plan a menu. With this schedule we had a great variety of meals and ate like kings. Throughout our crossing we saw many flying fish. Every morning we would look on deck to see if any had landed. On one of Shaun’s watches he was visited by 3 flying fishes. One wiggled his way off the deck, another he saved with a fly swatter and the last didn’t make it so we decided that there would be a biology lesson. We also tried out our fishing skills and were rewarded with a delicious mahi mahi. The first one we caught was thrown back as it was too small. The second one we caught was even smaller but died during our releasing efforts. We ended up having him as an appetiser. Delicious! There were several birds that we encountered along our way. Two of which crash landed on board for a rest. They were so tired and scared that we ended up making a little bed for them to rest in overnight before releasing them. We saw land birds as well in the middle of the ocean, they must have caught a lift on another vessel. One such bird, a white egrit was flying circles around our boat trying to find a safe place to land. Sadly, it was too frightened and flew off in search of another place. I saw a strange looking white bird for a couple of days flying around our boat. We never did figure out what type it was. There was one booby who tried to land on our jib while it was flying. It was quite the sight seeing his webbed feet straight out trying to land. During my night watches I was fortunate enough to see the most breathtaking starry nights with loads of shooting stars. Amazing how many stars are seen when there is no ambient light. During one evening we even got to see the International Space Station pass overhead. Throughout the day we saw some spectacular skies as well. For entertainment we played countless card games, animal guessing game, board games, watched movies, and cleaned the boat. I had purchased some surprise items for the girls and brought them out every 4-5 days to keep them entertained. There was lego, a make your own sushi candy kit, and a paint by number. We also celebrated crossing the Tropic of Cancer with banana bread. Our biggest celebration was our midway point. We painted nails and wore our paper chain necklaces. Throughout our crossing we had some items break. On day 2 our mainsail was torn at the third reef point while trying to shake out the reef leaving us without a mainsail. The boom was far out as we were on a deep broad reach. Shaun and I had always centred the boom to shake a reef but on this occasion did not follow our previous steps. This was our downfall. 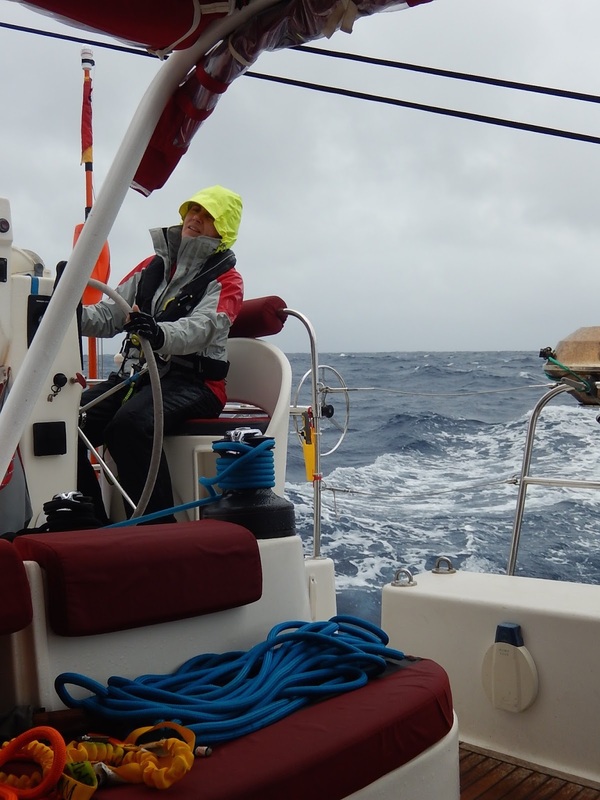 On day 15 our spinnaker self destructed as it was tightened too much and a squall hit breaking the sail apart. 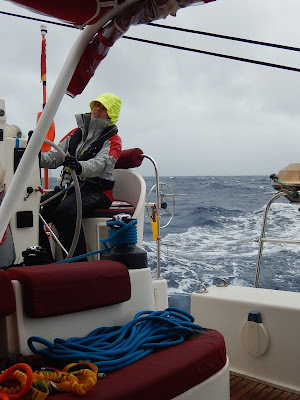 Luckily we had two more head sails allowing us to complete the journey. Due to fatigue Shaun accidentally tried to furl in a sail that wasn't flying. This resulted in a broken furling line. Throughout all of these misfortunes, we all pulled together and handled the situations with grace. On December 1, the girls were allowed to open their chocolate advent calendar. It was nice for them to have something to look forward every day. The crossing was better than I had expected. There was not enough wind but for the most part it was an easy crossing. 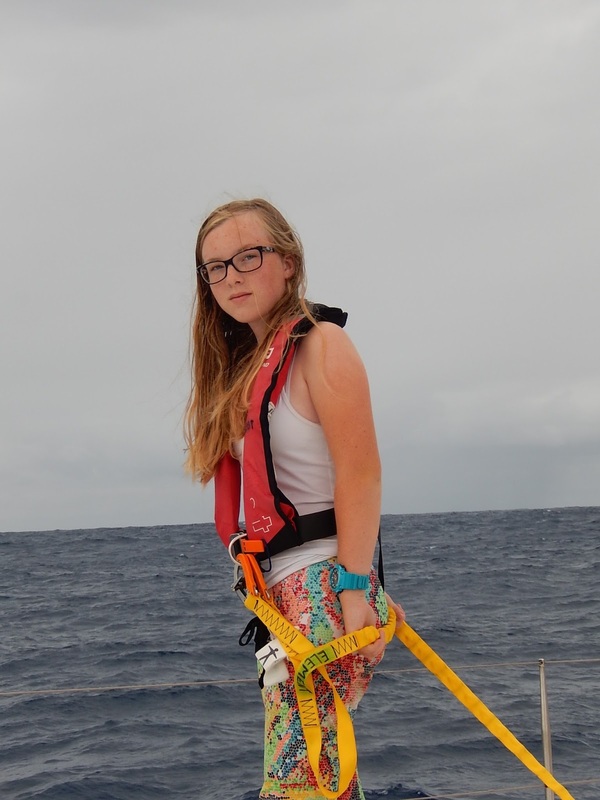 Our worst weather that we encountered was 5 nautical miles off of Barbados. There were 40 knot winds, hail and lightening so close that Shaun called it architectural lighting. Having the extra experienced crew made our crossing run smoothly. Below are some random photos of our adventure. 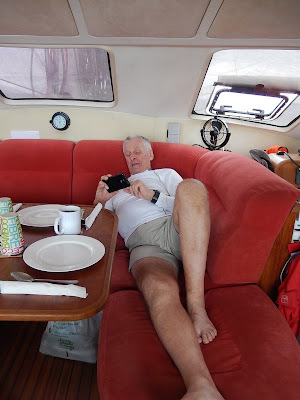 If you can be a passenger in a car driving across the Canadian prairies, you can sail across the Atlantic in a catamaran.Don't get me wrong I was very happy to step off the boat on to dry land. All in all it was a positive experience and I feel much more confident for future long passages.